This is a full, flowing poncho that crochets up in very little time. It has a two row repeat pattern with increasing that is clearly explained in the pattern. In the sample shown, two different yarns in the same colorway were used: Cherry Tree Hill’s Oceania (wool boucle with a splash of glitter) for the body, and Cherry Tree Hill’s Cashcott ribbon yarn for the trim. 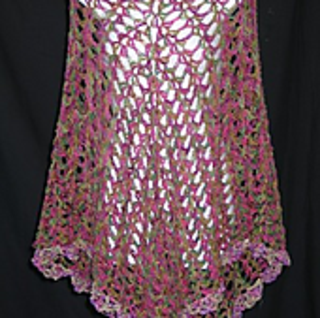 The poncho would look equally beautiful made with a continuous yarn.